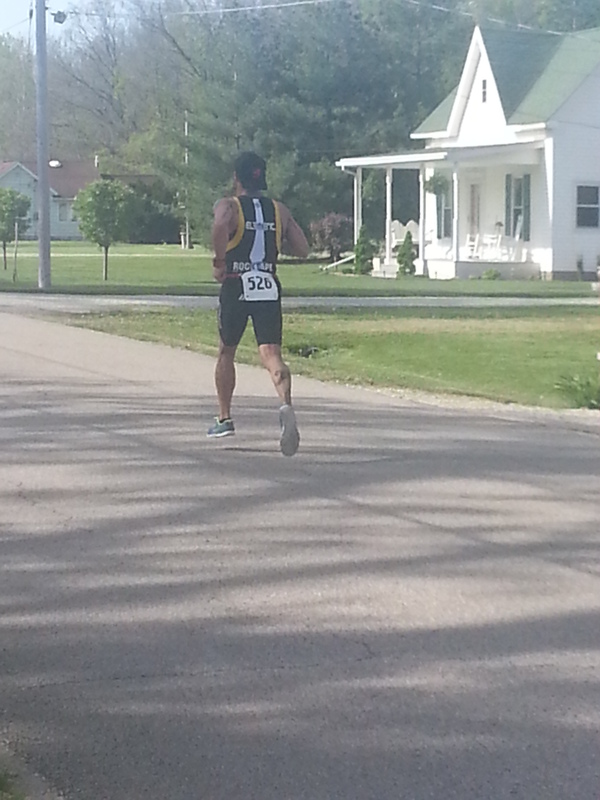 After a dreary winter where I lost 5 weeks of training due to illness – Pneumonia, flu and sinus infections, not to mention, scratching 3 races, I finally was healthy enough to race this past Saturday in Hutsonville, IL, at a rather competitive duathlon. 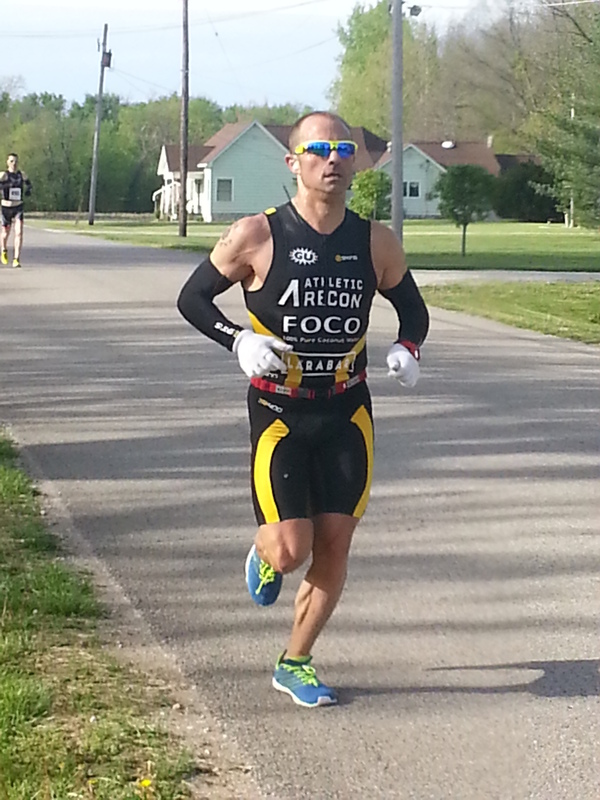 Spring in the Midwest means competitive racing in duathlon, for all the triathletes that didn’t venture South or West to race, and even though it might be cold, the competition heats up pretty quickly. I arrived at the race site the day before, and saw the familiar signs that we were in for a good day – flat run course, well marked, transition all set up, finishing chute already being prepped; sponsor tents buzzing with athletes. It felt good to be back. I got on out on the bike course and was immediately introduced to an old friend – Illinois chipped asphalt. And that is usually quickly followed by – brutal winds. My coach, Jennifer Garrison was right – I would have to “turn myself inside out on the bike” to stay at the front. I finished my spin on the bike, felt good spring in my legs, tossed on my Inov-8 155’s, and headed out to check out the run. I quickly felt that old feeling in my legs that I was so desperate for – snap, power, fast turnover. I held back a bit, not wanting to waste energy less than 24 hours before the actual event. Race morning came, temps in the upper 40’s, slowly climbing to 50. The sun was out, but the wind was whipping, so broke out the arm warmers and gloves. As I was arranging my bike in transition, I saw the familiar faces filing in, guys from Ohio, Indiana, Missouri, but the man to watch – former Duathlon National Champion, Andreas Maher. He and I have gone to war more times than I care to remember, as I have never beaten him. His unbelievable athleticism is only topped by his gentlemanly manner. He is a real beacon for the sport, and someone I enjoy racing with. It had been 4 years since we last battled, but we quickly fell into the old conversations – how you been, how you feeling, etc. Quick chat, both of us more interested in warming up. As the Race director called us to the line, Andreas and I slid quietly to the front. We wished each other well, and boom! there was the gun. I took off, perhaps a bit too fast, but thinking I would need to run extremely well to get some space from Andreas. I took the lead about 500 meters in, and continued on my pace to the turn around. I was running 5:15’s, slightly faster than I wanted, but I was committed now, so I had to keep the throttle down. I grabbed about 15 seconds of a lead heading into transition 1, and took off on the bike. I had to remind myself to breath deep for the first mile, there were 21 nasty, windy miles ahead. As I got to the 2 mile mark, Andreas went by, but I didn’t panic. His cadence looked slow, labored. I jumped out of the saddle, and caught him, passed him, and proceeded to bury myself for the rest of the bike. The wind was relentless, it felt like there was never a break from it. My cadence eventually had to settle into slower than I wanted, pushing 80 rpm’s in order to try and break the guys behind me. As we got to the bike turnaround, I did some quick math – 25 seconds on Andreas, about a minute on the next 3 guys. Not enough. I took a quick swig of water, and went back to work. I was about a mile away from transition, and I was covered in my own spit and snot. I didn’t care, at this point, I wasn’t letting go of this lead. I hopped off the bike, and boom – there was Andreas. Damn!! I thought I put more time on him. Screw it, I thought as I literally started out the second run in a sprint. My pace was stupid. I had to back off a bit, but I knew he had a nasty second run in his legs, one I’ve been on the receiving end of too often. Everytime I felt my pace slow, I’d force myself to push harder. At the run turnaround, I saw Andreas. I put time on him in just over a mile. So I pushed harder. I was about 200 meters from the finish line and I was starting to see stars. I didn’t care, as I sprinted to the finish, nabbing the overall win, and the course record for the 2.1 mile run/21 mile bike/5K run. I used a 5:25 mile pace to close the show and as I waited for Andreas to meet me at the finish he smiled and pointed – knowing what only the two of us knew – I finally got him. Great day, great race, and great way to start the season. My 155’s are super critical to my success, light and responsive Without question, the best running shoes around. Period.